Click on the TimerOne-r11.zip link, and it will download a zip folder to your computer. Find your Arduino Library folder (Video above explains how if you do not know how). In your Arduino Library folder create a new folder called TimerOne. Take the CONTENTS of the zip folder you just downloaded and put it in your TimerOne library folder. Remember that when you install a new library, you have to close and reopen the Arduino IDE for it to find the new library. Make sure to connect the long legs of the LED to the control pins. This should be at the top of your code, and will load the library. If you place this code in the void setup, it will do two things. The first is it will initialize an interrupt that will go off every .1 seconds. Understand the units for the Timer1.initialize command are in microseconds, so 100,000 microseconds would create an interrupt every .1 seconds. Now you have to tell arduino what to do when the interrupt goes off. This is done with the Timer1.attachInerrupt command. In the code above, you can see that the command is telling the arduino that every time the interrupt goes off, it should pause what it is doing, go and run the BlinkYellow function, and then afterwords return to whatever it was doing. 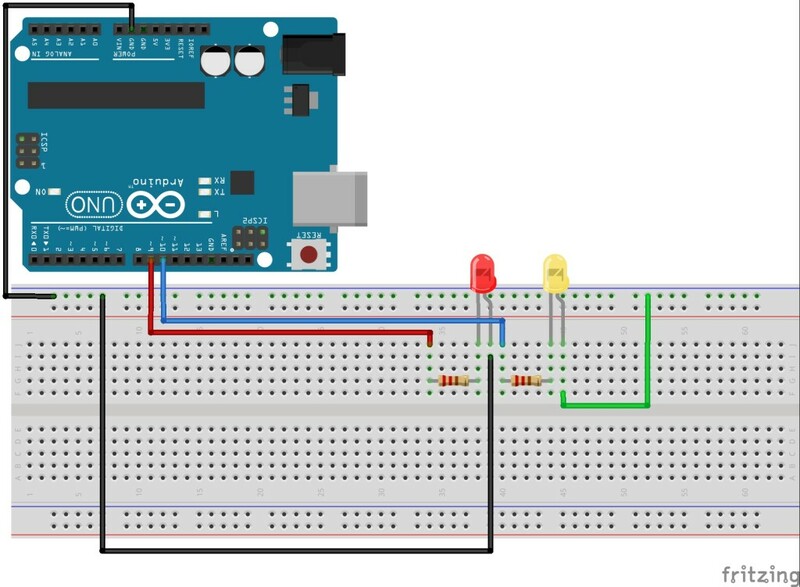 So, lets pull all this together to crate a program that will blink a Red LED slowly, 1 second on, followed by one second off, and then at the same time blink a yellow LED quickly using the Timer1 interrupt. The following code would do just that.